Windows CD-Key Revealer is a very simple and small application that instantly help you recover Windows activation key, which is especially useful in the event of losing its original physical form. The program does not require installation and its operation is child's play. Just run the downloaded file, and the second will receive a message containing our key product. The program supports virtually all versions of Windows, thus being a useful tool for anyone who somehow lost his key. 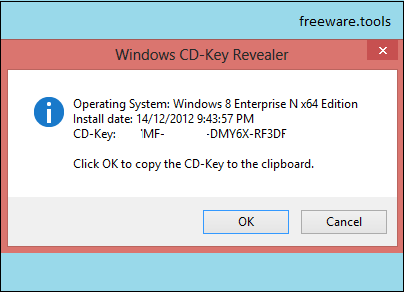 Windows CD-Key Revealer is one typical message box containing the product key. Windows CD-Key Revealer is a lightweight software application designed specifically for helping you get information about your operating system and Windows CD key using straightforward actions. This is a portable utility that can be run on your system by simply opening the executable file (there’s no setup included in the process). You do not need to appeal to third-party uninstallers for getting rid of it, as the task can be accomplished via a simple deletion process. In addition, you may store it on portable media devices, such as USB flash drives, carry it with you, and run it on the target system without administrative privileges. No entries are left in your Windows registry and other configuration items in your PC. Windows CD-Key Revealer doesn’t employ a GUI for helping you grab the desired information about your system. It actually employs a notification panel that embeds the necessary details. As soon as you open the executable file, the application automatically pops up a minimalistic window that shows information about your operating system, installation date, as well as CD key. If you click on the ‘OK’ button, the CD key is copied to the clipboard, so you may easily transfer data into other third-party utilities. Tests have shown that Windows CD-Key Revealer carries out a task quickly and without errors. It leaves a minimal footprint on your system resources. All things considered, Windows CD-Key Revealer delivers a simplistic and efficient software solution for getting the Windows CD key and information about the OS, and can be handled by rookies and professionals alike.